Welcome back to Vintage and Thrift Hunting this is Post #8. 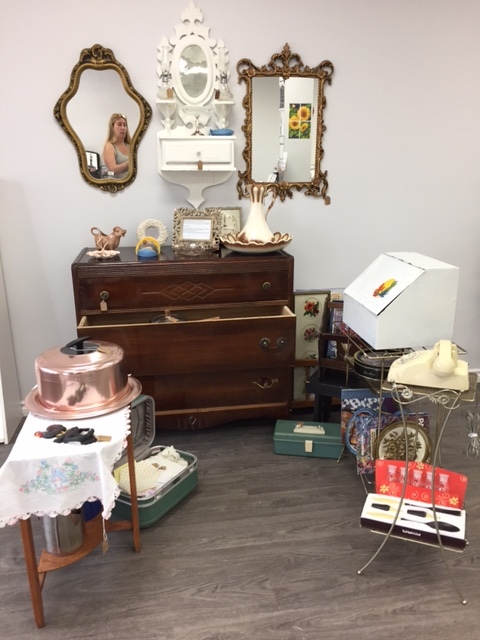 I am so happy you’re here and can’t wait to share with you my latest thrifty and auction finds as well as to tell you about my latest venture. I’ve been busy garage “saleing” and auctioning and found some good items to sell on my Facebook site and in my booth at the local photography studio. YES that is my latest venture. I decided to rent a booth at a local photo studio to show off and sell some of my vintage items. It was a big step for me and I know I have lots to learn but I’m excited I took this step. This is my first time renting and selling in a retail environment. Here is a picture of the setup – I welcome any feedback and/or suggestions my readers might have. The space is 5×5 and the only wall I have access to is the one with the mirrors. Ok so that’s my booth, now onto some treasures I found last week. 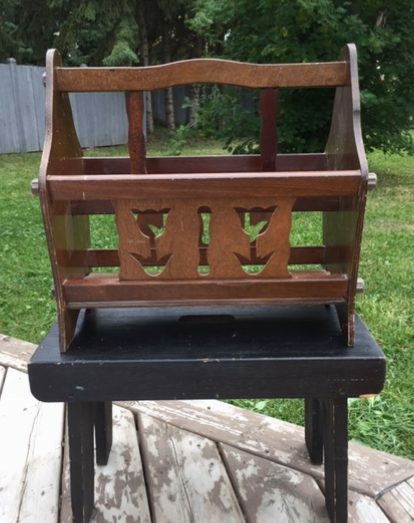 I couldn’t resist this Tulip cutout magazine rack and the handmade wooden stool. I put them both in my booth for $25.00 each. 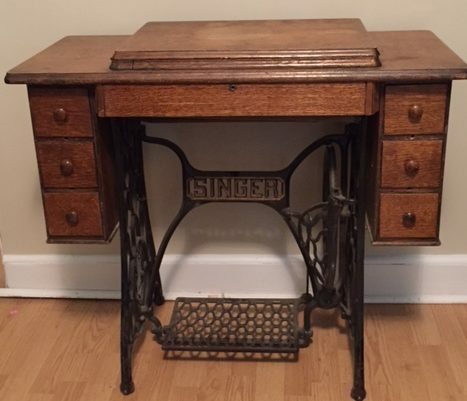 This beautiful antique Singer sewing cabinet with drawers sold off my site as soon as I posted it….the lady that bought it said she was going to use the bottom and make a table. I love it as is but I know it will also make a great table. 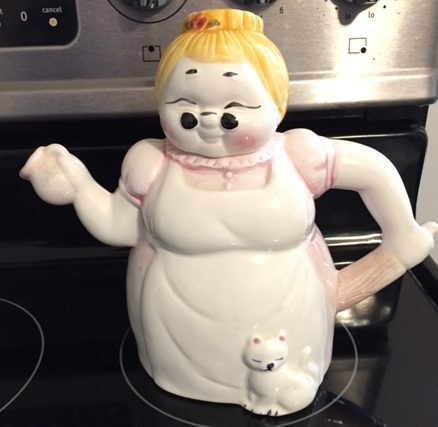 At first I thought this was a cookie jar but when I took her head off I realized it was a teapot, either way she was coming home with me. Does anyone know who she is? I’m keeping her for now, but would love to know if anyone has any information they could share. I did some searching on the internet but couldn’t find one quite like this. 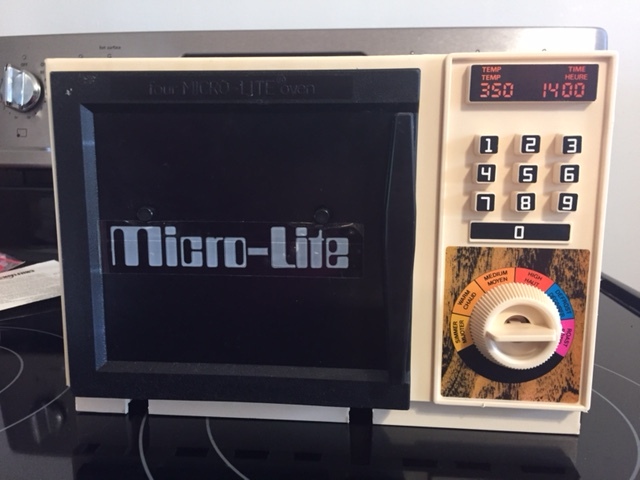 Next up is a Vintage Robin Hood Microlite oven. 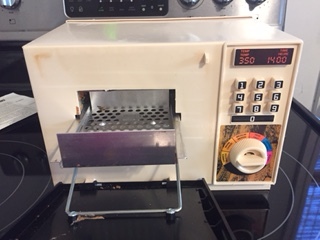 I was super excited when I realized the door opened like an Easy Bake Oven. 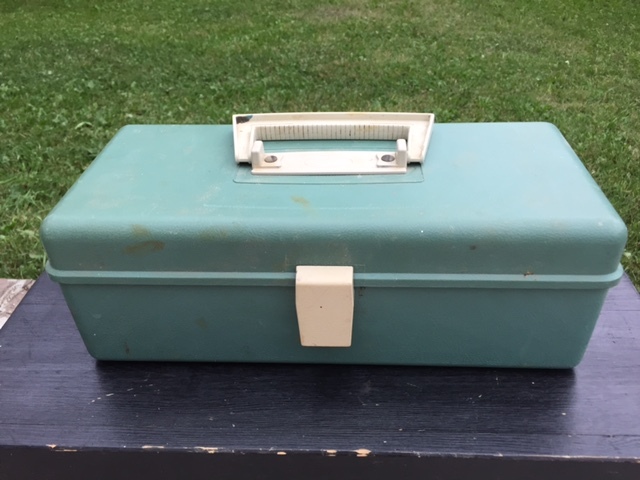 It was still in the original box with instructions and the utensils for baking. Selling for $15.00 on my FB site. That’s all for this post and I hope you come back next time as I am sure I will have lots more to share with you. There is a link below to my selling site if you are interested. 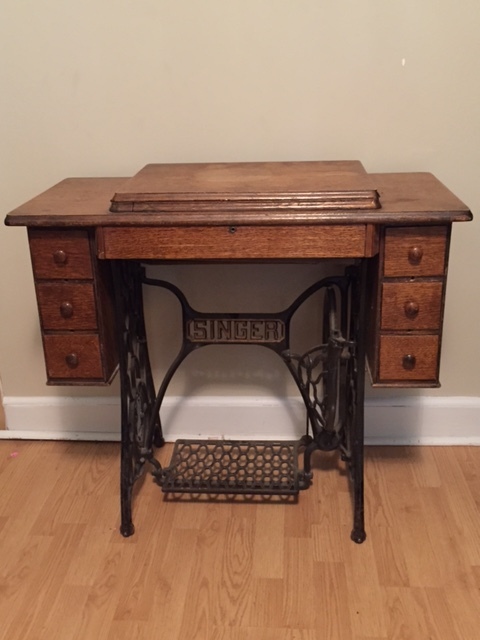 This entry was posted in Decorate, vintage and tagged antique, collectible, Decorate, display, dresser, handmade, home, machine, magazine, microlite, mirror, old, oven, rack, repurpose, reuse, sewing, sewing machine, simple, Singer, stool, suitcase, table, teapot, telephone, thrift, thrift store, thrifty, tulip, vintage, wood. Bookmark the permalink. Very excited for you. I have never met anyone who makes things happen like you do. You are an inspiration.